Cool birds and flowers design. BODY : 100% POLYESTER 3-M SCOTCHLITE. USED IN EXCELLENT CONDITION --LIKE NEW. Sugoi Jackie Short Sleeve Top. Color: Green. Size S, approximate pit to pit 18x 24" length neck to hem. Back is blank. Nice jersey. If not received, an Unpaid Item Case will be initiated. Very good condition. Good layer for outdoor winter activities. Sugoi RSR Tank Ultra Aero fabric for supportive stretch and superior moisture management Tailored fit with inner shelf bra for high performance fit and support Racer back construction with front and back mesh inserts for added ventilation Two rear fuel pockets store your run essentials Bonded detail at front yoke seams for additional reflectivity Size: Medium Color: True Blue New with tags. I have an over abundance of workout/training clothes. • MidZero™ (88% Polyester / 12% Spandex) fabric retains warmth with a soft, brushed inner lining. • Mitted uff system for added hand and wrist warmth. Newton Running Shirt. Jackie Semi Fit. 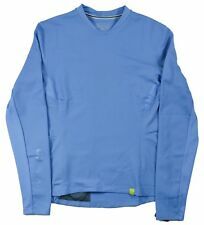 New Sugoi Fusion Core L/S top. Great choice for Triathlons, tennis & bicycling too, the back pockets can hold a water bottle and/or tennis balls. Ladies Sugoi Firewall 220 Cycling Jacket Size Large (L). Pre-Owned, but Very Good Condition. Two light, small stains on the inside of jacket (see pictures) and light pilling on front right outside by the pocket (see picture). Colors in photos may appear slightly different because of photography lighting and phone/computer screens, etc. We check every item as thoroughly as possible, for holes, stains, fading, odors, etc. Very good condition. 22" - length, shoulder to hem. Nice lightweight Sugoi pants. They are light - likely nylon - with a little bit of spandex/stretch. Great to wear casually or around town bike rides. Very good condition. Quick drying, lightweight inner brief. Inseam: 3.5". Waist: 14.75". 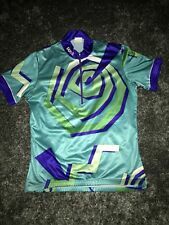 Cycling Jersey. Stretch Polyester Knit. Red Orange White Color Block. Athletic Shirt Top. Size Large. NWT Sugoi red/pink long sleeve windbreaker jacket. Two side zip pockets and one zip pocket on center back. Women’s Sugoi cyclist Tshirt. Size small. Short sleeve. V neck. Pinks in color. Pit to pit 18”. Length 22”. Great preowned condition. See pictures for details. Shipping: Items ship within 1 business day of payment clearing (except holidays and weekends). Feedback: I strive to earn positive feedback for each transaction completed. Please feel free to message me with any concerns or questions and I will gladly respond. TEAL print Racer Back TANK TOP. Built in Shelf bra. Racerback style. TEAL Light weight CROPPED PANTS. Light weight, quick dry. 86% polyester 14% spandex. They are in VERY GOOD gently used condition. 3 Back Pouch Pockets. Long Sleeve. 26" / 66 cm Length - center back of neck to bottom offront hem. 23 1/4" / 59.1 Length - center back of neck to bottom ofback hem. Great condition. Extremely soft material!! The shirt has a hidden front zipper closure and three back "pouches". COLOR:Yellow, Green, Blue, Orange, Black, Purple, Red and White. SHOULDER TO SHOULDER: 15 ". LENGTH OF SHIRT: 23". MATERIAL: 100% Polyester - Hand Washable. Fleece Lined. Under Arm to Under Arm: 20". Sogoi Logo on back neck, down the sleeve and front chest. Length: 26". 1 Back Pocket For Electronic.